As with all of our plans, you are building at your own risk and you should have a firm understanding of building in general before you attempt many of our plans (some are easy as pie and perfect for beginners). With that, go forth, have fun, take lots of pictures and share them in a showcase or on social media with the hashtag #builtTDCtuff and we will share our faves! 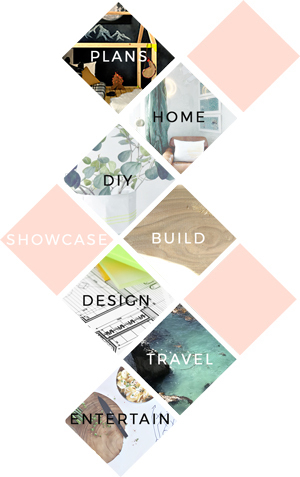 Be sure to tag @thedesignconfidential on Instagram / FB and @thedesconf on Twitter. For the Back Wall, cut the pieces for the Posts, Side Top, Side Rail, Side Bottom, and Side Short Studs. With the Kreg jig set for 1-1/2” material, drill pocket holes in both ends of the Side Top, Side Rail, Side Bottom, and Side Short Studs. Make sure that the pocket holes drilled into the Side Bottom are within the area that will make contact with the Posts. Assemble as shown with glue and 2-1/2” Pocket Hole Screws. Cut the pieces for the Side Bed Rail and Cleat. Attach the Cleat to the bottom edge of the Side Bed Rail using 2” Wood Screws. Clamp the Rail/Cleat “set” into place as shown, leaving a 1-1/2” space on each end for the End Rails. The Side Bed Rail, Cleat, and bottom of the Side Rail should be flush with one another. After making sure that everything is completely square and aligned, use a 7/16” Drill Bit to drill through the Side Bed Rail, Cleat, and Post. You should have two holes on each end for the Bolts. Fasten with Carriage Bolts and tighten. For the Front Wall, cut the pieces for the Posts, Side Top, Side Bottom, Rungs, and Side Long Studs. With the Kreg jig set for 1-1/2” material, drill pocket holes in both ends of the Side Top, Side Bottom, Rungs, and Side Long Studs. Make sure that the pocket holes drilled into the Side Bottom are within the area that will make contact with the Posts. Assemble as shown with glue and 2-1/2” Pocket Hole Screws. For the Head Wall, cut the pieces for the End Rail, End Bed Rail, End Bottom, and End Stud. With the Kreg jig set for 1-1/2” material, drill pocket holes in both ends of the End Rail, End Bed Rail, End Stud, and End Bottom. Assemble as shown with glue and 2-1/2” Pocket Hole Screws. For the Foot Wall, cut the pieces for the End Rail, End Bed Rail, End Bottom, and End Stud. With the Kreg jig set for 1-1/2” material, drill pocket holes in both ends of the End Rail, End Bed Rail, End Stud, and End Bottom. Assemble as shown with glue and 2-1/2” Pocket Hole Screws. Cut the pieces for the Slats. The Slats will be spaced approximately 4” apart. Attach to the Cleats on each end using 1-1/4” countersunk screws. Cut the pieces for the Rafters and Roof Ridge. Cut the bottom ends of the Rafters at a 45-degree angle as noted. With the Kreg jig set for 1-1/2” material, drill pocket holes in both ends of the Rafters. Assemble as shown with glue and 2-1/2” Pocket Hole Screws. Cut the pieces for the Back Wall. If preferred, you can cut the Back Wall out of a solid piece of 3/4” plywood. However, this image shows the Back Wall made of several different pieces – time to use those scrap pieces of 3/4” plywood! Cut the top of the Upper Back Wall at a 45-degree angle. Attach to the back of the Bed Frame with glue and 1-1/4” Wood Screws. The Back Wall should be attached to the Bed Frame 1/4” from the ground and have a 3/4” overhang on both sides. Cut the pieces for the Front Wall. The Front Wall will be cut in two sections – an Upper and a Lower section since plywood comes in a 48” width. Cut the top of the Upper Front Wall at a 45 degree angle. Make the ladder cut-outs with a drill and jigsaw. For these interior cuts, start at the inside corner of the cut-out and drill a hole slightly larger than the blade of the jigsaw. Insert your jigsaw blade and make your cut. When the wall is attached to the Bed Frame, the cut-outs should line up just above a 2×4 for extra support. Attach to the front of the Bed Frame with glue and 1-1/4” Wood Screws. The Front Wall should be attached to the Bed Frame 1/4” from the ground and have a 3/4” overhang on both sides. Cut the pieces for the Head Wall. Attach to the head of the Bed Frame with glue and 1-1/4” Wood Screws. Cut the pieces for the Foot Wall. Attach to the foot of the Bed Frame with glue and 1-1/4” Wood Screws. Make the window cut-outs with a drill and jigsaw. For these interior cuts, start at the inside corner of the cut-out and drill a hole slightly larger than the blade of the jigsaw. Insert your jigsaw blade and make your cut. Cut the pieces for the Roof. Each end of the Roof pieces should be cut at a 45-degree angle. Attach to the Rafters and Ridge of the Bed Frame with glue and 1-1/4” Wood Screws. That’s it! Experiment with painting the inside of the Bunk Bed a different color than the outside. You can also play around with installing puck or rope lighting… the possibilities are truly endless with this Bunk Bed!